sK1 is an open-source illustration program for the Linux platform that can substitute professional proprietary software like CorelDRAW or Adobe Illustrator. Unique project features are CorelDRAW formats importers, tabbed multidocument interface, Cairo-based engine, color management etc. The multipage feature is very handy for designing booklets with vector graphics or presentations, which you could project with impressive (former keyjnote). Under the hood Inkscape and sK1 share Uniconvertor, for importing, exporting and converting vector graphics. Uniconvertor was developed by the sK1 team. (sK1 is a fork of the Skencil project.) Another difference from Inkscape, is that sK1 itself is developed mostly in python. So you could in a way it use as a python library. 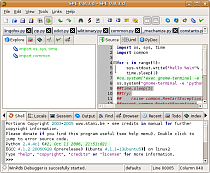 sK1 is being developed under Mandriva and it is hard to install on Ubuntu (especially for graphic designers). I noticed that Vladimir Osintsev was preparing a package for Ubuntu. I contacted him and invited him to work together on it within the Debian Python Package Team. So hopefully sK1 will become available in Debian and Ubuntu (from Karmic). You can read my PPA page https://launchpad.net/~stani/+archive/ppa for more information. Disclaimer: this is the development version of sK1 and the packages have not been tested by a critical mass. In case you have problems, you should report them on the sK1 forums. The packaging is not perfect yet. For example there will be no entry in the start menu. This will be fixed in a next release. I've sent Igor from sK1 the necessary files to resolve this issue. So for now start sK1 by typing "sk1" in the run dialog (Alt+F2) or in a terminal. As a final remark: you need to remove your ~/.sk1 folder, otherwise sK1 might have troubles starting up. Ewww! KDE3! Dang, I'm a KDE lover, but... KDE***3***?! On a new app? The edit mode seems to be very intuitive though, and I like that there's already a fill option (which Inkscape only got reasonably recently). Anyway, the idea of a more press friendly vector program sounds great. Hopefully we'll see a KDE4 version sometime. One question: why is this story tagged under Blender? sK1 has nothing to do with KDE. It uses Tk, not Qt. The icons might be based on Crystal, but that doesn't turn it into a KDE4 application. The icon theme of sK1 will be customizable, so feel free to make an Oxygen theme. This was filed under Blender as I use vector applications in combination with Blender. Feel free to disagree. Post further questions on the sK1 forums. I understand this is a temporary location, but would be still great if you made a separate PPA for it (don't need to register a whole new team now, too). This in indeed a temporary solution. Our goal is to push sK1 in Debian and Ubuntu. It will be only available in Ubuntu Karmic, but we'll try to backport it to Jaunty and Intrepid. The only other program in my PPA is Phatch. Unfortunately that is not possible as Hardy does not have tcl8.5 and tk8.5 in the PPA build systems. Donate to get a nice pdf manual with screenshots!